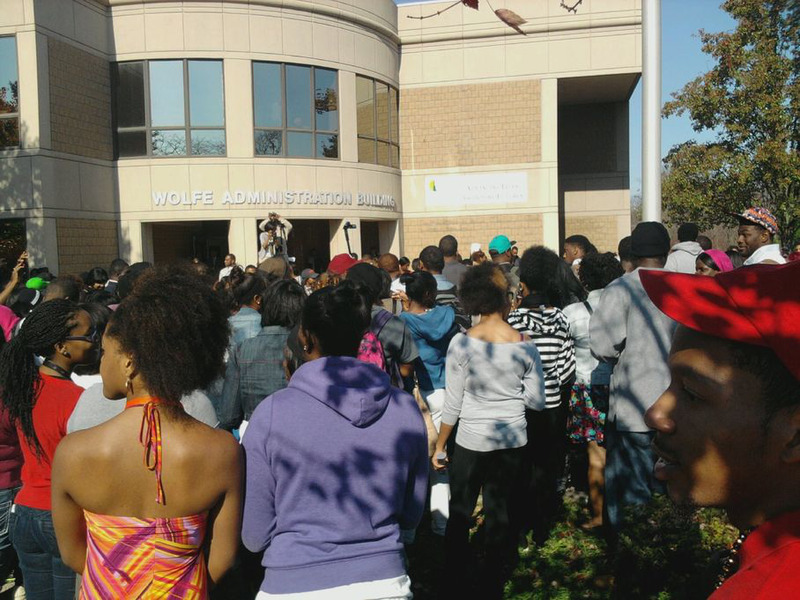 Wilberforce students protested, threatened to transfer in October. When it comes to the future of Wilberforce University, graduating senior and student government president Brandon Harvey doesn’t see much hope. He’s afraid his alma mater—the nation’s oldest historically Black university—might not survive the next two years. “Our graduation rate is only 32 percent; our retention rate is only 64 percent,” he said, quoting figures pulled from Collegestats.org, a site that aggregates data from the National Center for Education Statistics. Those numbers, as well as dissatisfaction over the condition of dormitories and the school’s library, and the small range of course offerings, inspired a unique protest at the small school near Dayton, Ohio. Last October, 337 students—more than two-thirds of the student body—threatened to withdraw in fall 2013 unless conditions and services improved drastically. 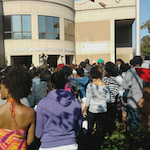 The students walked from their student union to the main administration building. After receiving withdrawal forms, the students marched to Central State University, a public school adjacent to Wilberforce. Harvey said Wilberforce president Patricia Hardaway never addressed the students. After the protest, Hardaway held a press conference at her residence. She told reporters the school planned to address the students’ complaints. “There is not a university in the universe that relishes the idea of students withdrawing. Certainly we do not relish that idea either,” she said. Hardaway did not respond to two requests for an interview for this story. Protestors’ complaints included the quality of student advising. Harvey claims several students who graduated in 2012 later found they hadn’t completed requirements. “How do you allow 20 students to walk the stage, then call them in May and say ‘Hey, you forgot a course,’” he said. An official figure wasn’t available, but Harvey estimated about 140 students graduated in 2012. He blamed the confusion on poor recordkeeping and inadequate counseling. Students were also concerned about a lack of security on campus. Harvey remains pessimistic about a dialogue with Hardaway. He said he did not speak to her until January, and then she didn’t address the students’ concerns. “She really wanted to know whether any faculty had handed me any documents, showing like payroll,” he said. The demonstration was the latest blow to an institution that is struggling to make ends meet. According to its 2011 tax return, Wilberforce had a net worth of $5.5 million and is $29 million in debt. Depreciation has reduced the value of buildings and equipment by 40 percent to $17.7 million. The school no longer contributed to employees’ retirement fund. In addition, Wilberforce is having a hard time attracting and retaining students. The college had 689 students in fall 2010, according to records from the NCES. Current figures are unavailable, but Richard Deering, an associate professor and former union president at Wilberforce, claims fewer than 500 are now enrolled. “I don’t know what the final figure will be, we’ll probably be 430 plus or minus,” he said, adding that the numbers were released during a faculty meeting. The university’s troubles go back to 2003, when the school was in a fiscal morass. Floyd Flake, who was president at that time, made severe cuts to save money, including slashing academic programs. Faculty members also took a 10 percent cut in salary or retirement benefits. But Flake became controversial, especially when his compensation ballooned as the school’s finances deflated. Flake made $123,000 in salary and compensation when he started at the university. When he left in 2008, he made $340,100 in salary and other benefits. Flake said his work justified his salary. “If I bring in $14 million and [cost] $210,000 a year, my salary seems worth it,” he reportedly told the Dayton Daily News shortly before resigning. But faculty claimed Flake wasn’t running the school effectively, and gave him a no-confidence vote. “The criticism … had to do with the fact that there were large increases in the salaries, and Floyd Flake was only on campus one day a week. He would fly up Monday morning, and then probably go back Tuesday morning. It was felt that that was a huge salary relative to the amount of time that he spent on campus,” said Deering, who headed the union during Flake’s tenure. He also discounted Flake’s fundraising efforts. Hardaway, who was provost, became president after Flake’s resignation. She cut spending and salaries, including her own. She now makes about $144,000 in salary and benefits, compared to $200,000 she made as provost. But tensions between the faculty and administration didn’t grow warmer. Hardaway got a no-confidence vote from the faculty union and the alumni. In 2011, the faculty and a group called Concerned Citizens of Greene County asked the Ohio Attorney General to investigate the president and board for fiscal malfeasance and neglect. But the office found no evidence of violations and closed the investigation.